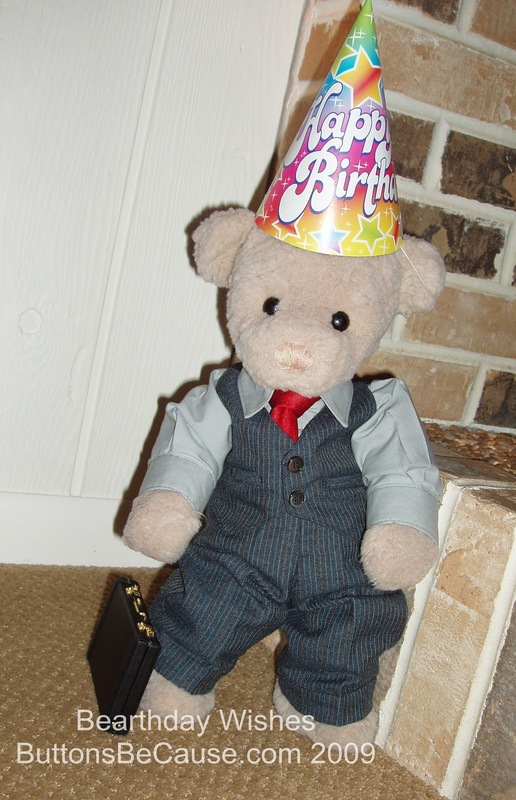 I put on my party hat to attend my friend Sir Woodstock's Bear Day party. The invitation said wear a fancy hat. I hope getting all dressed up in my suit, makes up for my hat not being so fancy. Woodstock, I wish you many happy returns of the day on your special day! Now, where is the cake? And is it chocolate? Things around here have become quite a mess. It's the annual transition from fall to Christmas decorations, looks like a bomb went off. Mom said no pictures till she gets things under control. She is going to be busier than she has been the last couple of weeks. She got a new sewing machine, it embroiders. Sewing machines have taken a quantum leap since she got her last one 20 years ago. So, she is spending a lot of time learning all the bells and whistles of the machine and software. She says that teaching an old bear new tricks may take some time. Her first project is to make the grand nephew Ethan a Christmas stocking. She says when it's done I can show it to you. In the meantime...I'll keep hoping for her to make me some more cool clothes. I am thankful for honey. Around here, there are so many bears, that mom and dad always use code when speaking of honey. They call it "H", I think they are afraid of a bearpede.